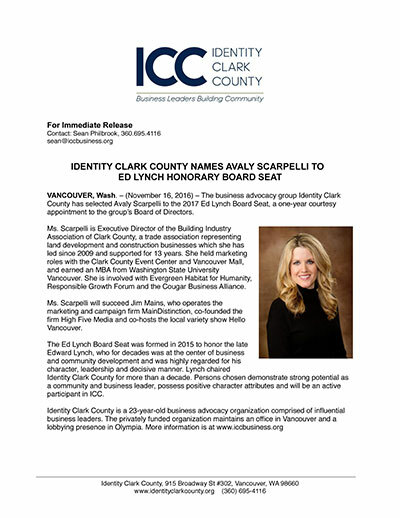 The business advocacy group Identity Clark County has selected Avaly Scarpelli to the 2017 Ed Lynch Board Seat, a one-year courtesy appointment to the group’s Board of Directors. Ms. Scarpelli is Executive Director of the Building Industry Association of Clark County, a trade association representing land development and construction businesses which she has led since 2009 and supported for 13 years. She held marketing roles with the Clark County Event Center and Vancouver Mall, and earned an MBA from Washington State University Vancouver. She is involved with Evergreen Habitat for Humanity, Responsible Growth Forum and the Cougar Business Alliance. Ms. Scarpelli will succeed Jim Mains, who operates the marketing and campaign firm MainDistinction, co-founded the firm High Five Media and co-hosts the local variety show Hello Vancouver. The Ed Lynch Board Seat was formed in 2015 to honor the late Edward Lynch, who for decades was at the center of business and community development and was highly regarded for his character, leadership and decisive manner. Lynch chaired Identity Clark County for more than a decade. Persons chosen demonstrate strong potential as a community and business leader, possess positive character attributes and will be an active participant in ICC.